Two gravesite ceremonies were held - at 9am and 5pm. 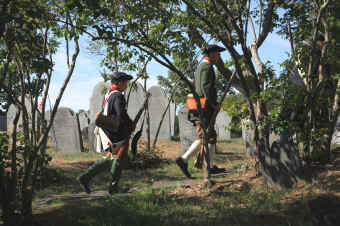 The Concord Minutemen discussed the role of Colonel James Barrett at the start of the American Revolution. The Barrett family gathered to pay respects. A musket salute to the Colonel. The Colonel's headstone. Here rests in hope ye body of Col James Barrett who departed this life April 11th, 1779 in the 69th year of his (age). Sudden the summons came, and quick the flight! We trust to be with Christ in realms of light. In public and privet life he was courteous benevolent & charitable. His fidelity, uprightness and ability in various offices and employments justly procured him esteem. For many years he represented his Town in General Court. He early stept forward in ye contest with Britan and destinguished himself in ye cause of America. His warm attachment to and careful practice of ye religion of Christ compleated his worthy character and with his other virtues will preserve his memory and rank it with that of the blessed. which hastens on the swiftest wings of time! Death steals upon you like a midnight thief! His step is secret but yet sure and may be near and unexpected!